Good Question of the Week: Is Waterproof Ink Safe for Pens? Platinum Carbon Black is the ink I use for waterproof drawing. It’s fully pen safe > in my experience < I’ve used it in their name-brand Platinum Carbon Pen, a number of Noodler’s pens, and a number of Lamy pens. (Link to my drawing gear page). There are other nano-particle inks, but it’s the only one I’ve tried personally. The thing is, ask an antique car guy about taking care of a car and they’ll say; don’t drive it in the bright sun, don’t let kids in the car, for goodness sake don’t live in a place with winter! In other words, pen collectors treasure the pens as objects. Artists want to use them into the ground, and treasure the drawings they make. If Platinum Carbon does shorten the lifetime of then pen – I really don’t care, and I’ll never even know – I buy Lamys for around $40, and hope to lose them in an alley in Macau or a taxi cab in Havana! 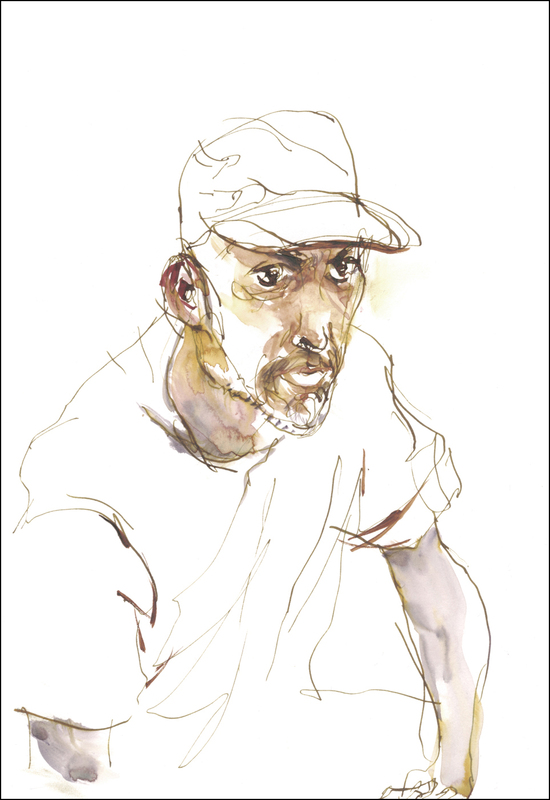 ← Have you tried Sktchy? I have been using Koh-i-noor black ink for my fountain pens, It is an ink for technical pens which have very tiny parts.. It seems to be working, And I have heard the same thing from sales people in stores..that it has shellac in it so dont use it in fountain pens. I put it in to my two Sailor Fude pens, my Lamy Joy, not so much in my Namiki Falcon, but I want to..I have tried Noodlers blacks, Eel and Bulletproof black, but they dont seem as black as the Koh-i-noor..
Goulet pens reccommends De Altramentas Document black but it is $20 for one once, seems pricey. Also most places seem to be out of stock on the Platnium Carbon Black..Thanks for your answer tothis. Seems like so many Urban Sketcher are using fountain pens and then watercolor. We need a good black permanent ink that wont bleed. Have a Happy Holidaze!! I am hoping to meet you in person in Chicago!! As a side note, Koo-I-Noor used to sell an ultrasonic cleaner for technical pen nibs. I bet you could find them on ebay, and the would work like a charm on fountain pen feed. Device is the same as an ultrasonic jewelry cleaner I do believe. Thanks , I know about those, good idea, I will look. I use their cleaner fluid, and a syringe. Cleaning often is the key ..in fact today might be fountain cleaning day!!! I found a fountain pen repair page that recommends the Koh-i-noor cleaning solution in an ultrasonic for cleaning out vintage FP feeds if they’ve had shellac-based ink run through them. It will probably shorten the life of your pen. Please, please don’t run shellac based ink through your Falcon! (wincing) That’s a marvelous pen, but in my experience a little more delicate than the Lamys, which are workhorses. What works in a Safari or a Joy may not work at all in a Falcon. Try the Noodler’s Black in the Falcon — they tend to run wet (in my experience) so the black should be nice and dark. I started getting into fountain pens during this year’s Inktober. All my pens so far are Jinhaos, Heros or Dukes from Asia (I was using a Shaffer for a while). The ink I have been using in all of them is Hero’s 234. It was praised in different circles as a waterproof ink and, I believe, a carbon ink. It seems more water resistant than waterproof, depending on the paper (cold press works well) and how dry the ink is. The ink disperses more quickly on the paper with straight water but holds quite well with water and pigment. It suits the way I work and at about $6.00 for a 56ml bottle it’s a great deal. It has a rich black finish. After almost 3 months I have not had a blocked pen but, as you indicated Marc, I keep them in use as well as cleaning the feed/nib every few fillings. I use Carbon Ink and De Altramentas Document black. No problems at all. However, I am constantly using them. If a pen does not get used much I will go back and check on it. I agree with you the key is to definitely use your pens. Pens that are not in used are stored empty and clean. I have been using Noodlers Bulletproof black in a Pilot Penmanship and Lamy Safari for years in my watercolors, never had a problem. I am also NOT a pen cleaning fanatic. I’ve been using Noodler’s Black and Lexington Grey for years in Lamys with no problem. I clean them occasionally with distilled water. Lexington Grey is my favorite sketching ink. Almost black and a bit more interesting and waterproof. Lots of tutorials on You Tube by Goulet Pens. I love the DeAtramentis Document waterproof inks also. Second the recommendation for Noodler’s for waterproof inks, which are formulated and time-tested for fountain pens. (The potential exception is Baystate Blue, which is gorgeous but stains like a mofo.) Bulletproof Black is the classic, but there are some interesting different options. Plus Noodler’s is fairly cheap for the giant amount you get. Platinum Carbon is also great. India ink (the kind you use in technical pens) truly will destroy a fountain pen — the feed just isn’t engineered for it. If it’s a cheap one, that may be ok with you. India ink, like Koh-i-noor, is for technical pens, not fountain pens. In my experience, whenever you can, get your ink from a retailer like Goulet Pens rather than Amazon. First because it’s good to support independent business, and second because they absolutely know what they’re talking about. I also like Goulet’s Ink Samples – it’s enough to make a half dozen drawings and have a good idea if the color is for you. But – I end up paying duty if I go with them, so up here in Canada there is WonderPens. Also run by a husband and wife team, and also very knowledgeable about pens and inks. A few years ago, when I started drawing in ink and wash, my local pen shop owner was similarly discouraging….but I found the Platinum Carbon and then the de Atremis ink and have never looked back! I can full endorse your advice! And I do occasionally use an inexpensive ultrasonic jewelry cleaner. Pen stores are missing out on a big market! I think your first, short answer, was the best. There is a world of difference between the nano-particle inks and other (india, acrylic) waterproof inks. The nano-pigments also make Platinum Carbon, Sailor nano and DeAtramentis Document inks more expensive than those other waterproof inks. Even the fear of letting pens sit around with these inks is unfounded in my experience. While NO ink should sit in pens for long periods of nonuse, the nanopigmented inks are no worse than any of the dye-based inks. I also use Noodlers Bulletproof ink in my Lamy Safari fountain pen, and another fountain pen, and never have had a problem. 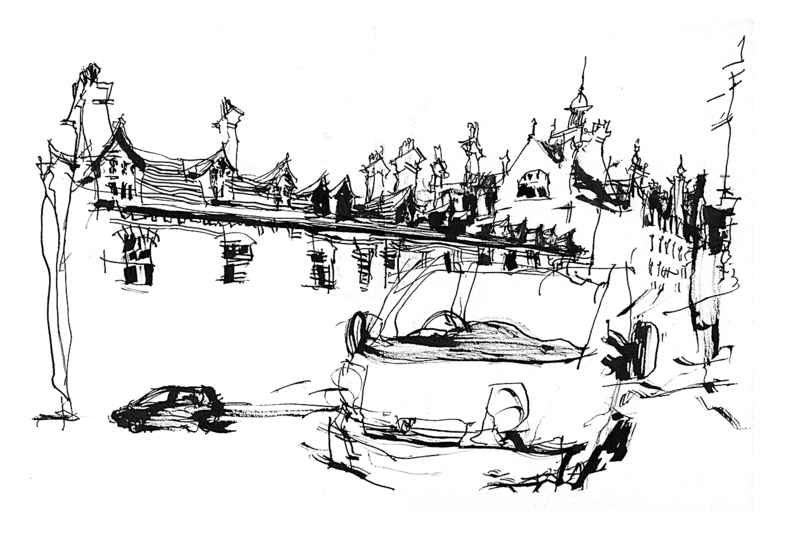 A fellow urban sketcher suggested to take out the ink every few weeks and flush it out with water. I’ve been using Noodler’s Walnut (which is partially bulletproof) without problems. The store owner needs to educate himself better. I draw with a Platinum Carbon Desk pen with the carbon ink cartridges. I also draw with a Pen & Ink Sketch pen using a converter with their bottled non-shellac india ink. Both pens work awesomely, with weekly use. In my case, I’ve used inks made for each pen. good read, shared this on my fountain pen and calligraphy group! I am new to fountain pens, I have two Lamy Safari pens and a Noodler’s Creaper…I write in my journal every day and do some sketching with Noodler’s bullet proof ink. So far I haven’t had problems..but the pens I’m using are not expensive so I’m not too worried since I use them daily. I do take good care of them though by keeping them clean. I bought Premium Carbon Ink from a seller on Amazon and it was not waterproof at all. Marc said it was probably a knock off. I returned it and got a refund. There is another seller there that I might try but still a bit hesitant right now. I doubt that it was a knockoff but I’d bet they’re not sending you Platinum Carbon Black but rather sending you Platinum Black, which isn’t waterproof. A lot of the third-party sellers (mostly from China and Japan) don’t seem to be very knowledgable about their own products, often using the wrong photos to represent what they’re selling, etc. Buy your fountain pen inks from a place that sells fountain pens. In the US Jet Pens and Goulet Pens are good sources for Platinum Carbon Black. In Canada, Wonder Pens in Toronto stocks it. I just ordered platinum carbon from China, or at least on Amazon because both jet pens and Goulet pens have been out of stock…we will see when I get it if it is waterproof..
Who knows what will get sent when ordering from people who can’t get this stuff straight in their listing. They know what they’re doing/selling and I’ve bought PCB from them before. This is FASCINATING Larry. (Did you guys know Larry is a real detective? Or at least he writes mystery novels :) Check out Her Book of Shadows! So, that is some great work on this problem. You see to have cracked the case. I’m going to go double check listings Amazon sends me. Thanks very much for this. Truthfully, for Canadian artists, you can’t do better than buying PCB from Wonder Pens. You’ll find their price to be only a couple bucks higher than the US vendors (much less than the current exchange rate) and the shipping is cheaper because it’s within Canada. Besides, they’re really nice folks, trying to supply we Canadians with good fountain pen products. Well in the picture there it is correct, its the gold label Carbon Ink! Looks good! I’ve used Carbon Black in my Lamy vista and haven’t cleaned it in over a year. It’s never clogged or had other problems even though I’ve gone weeks between using it. I think if you buy a high quality ink, it’ll just be safer in the long run. A wonderful way of saying “get your priorities right”. Utterly helpful to me. Thanks so much. If you have a very expensive pen, or an heirloom from your grandfather, I understand following these precautions and sticking to inks that are easier to dissolve. But that said, if you know you’ll never use the pen with the water soluble ink, why waste your lovely pen? They’re made to be used! I don’t own any expensive pens (maybe one day…) but in my book, a $100 pen that gets used everyday for five years and then breaks will have earned its price more than a $100 pen that lasts decades but was used ten times. Is it better to use waterproof ink in fountain pens? Or some other ink? I have Schaefer pens my daughter has Manuscript pens. We don’t use them for drawing just everyday writing. Washable (water-soulble) ink is better for cleanup if it gets on clothing or household items. OLD ink or India ink (anything schellac based) is bad for pens. (Clogs). and OLD vintage pens may have parts that are weakend by corrosion, or sensitive to acidity, and may suggest mild (washable) ink. But with a new pen, and new ink, waterproof is fine – AS LONG as it’s nano-particle ink. Such as Platinum Carbon ink.